Transporters and fleet owners involved in the distribution of frozen goods make massive investments in appropriate equipment. 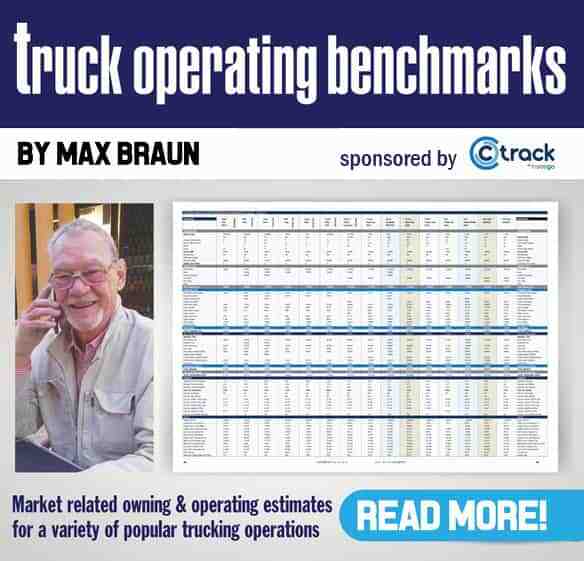 In this annual update of the refrigerated trucking sector, FleetWatch special correspondent Max Braun examines the products, trends and issues that are affecting and impacting on the transport of perishables in South Africa. Transporting perishables by road is one of the most demanding transport tasks you will find in the diverse road freight industry. Transporters and fleet owners engaged in distributing and delivering frozen and chilled products over long and short distances make massive investments in appropriate equipment, trained personnel and related physical resources to provide best practice services in terms of reliability, on time deliveries and product quality protection at acceptable cost to consignors and their customers. Almost regardless of the perishable product, the fundamental nature of successfully transporting perishables resides in how much time goods remain in pack houses, cold rooms,vehicles, containers, ships (this especially as it refers to exports and imports), distribution centres and retail cold rooms. Depending on how long the goods being transported spend in all or any of the “legs’ in the cold supply chain, they are at risk of losing value. On-going studies by the Fresh Products Export Forum (FPEF) and the Perishable Products Export Control Board (PPECB) to monitor the impact of changes in temperature, relative humidity,packaging and rough handling at various stages during transportation, indicates a number of issues that need to be addressed. For one, the ever increasing congestion and delays at harbours,pack houses, cold rooms and retail stores remains a challenge for farmers, shippers and transporters that strive to achieve ongoing best practice transportation services. This writer has been closely allied to refrigerated transport for the past 11 years during which time I have developed a network of experienced, knowledgeable and successful operating managers, fleet owners and managers, transporters and equipment suppliers. During this time, I have become progressively disappointed at the ongoing deterioration in attitudes, support and lack of recognition refrigerated transporters receive from government, Transnet and many other role players within the cold supply chain network. Currently, a typical 28-pallet Reefer has a capital cost of approximately R1,85-million. Covering just 180 000 kilometres a year and provided the Reefer is correctly and economically utilised, the operating costs will exceed R2-million before overheads, administration expenses and toll fees. Based on the August 2010 diesel price, fuel represents at least 35 percent of the operating costs. Smaller vehicles typically engaged in secondary distribution and delivery transport tasks are exceptionally expensive to operate due to the low level of payload utilisation and the modest kilometres travelled , usually, synonymous with such transport operations. Harbours controlled by Transnet have yet to show some real determination to improve the time taken to unload vehicles that stand up to three days (with fridge running and driver being idle). This is a major problem during seasonal peaks especially when it refers to citrus exports. Why so long to process? Independent research during recent months revealed that Durban harbour was operating at 75% capacity. Why then does it take so long to process vehicles? At the time of writing, transporters were alleging that Transnet’s Port Terminals were not fulfilling their mandate to facilitate the country’s exports and imports by giving preference to transhipments that consequently create logjams. Writing in Cargo Info Africa, harbour carriers say transhipments take up to 45% of the valuable space. Transhipments, they claim, require more handling time than that needed to handle export and import containers. Such delays undermine the country’s hard won export markets and add to transporters’ costs by way of huge amounts of unproductive time, wasted fuel and idle drivers. In other countries, transporters charge demurrage when their vehicles are unnecessarily delayed. What top level efforts were made to resolve the June 2010 strike by Transnet workers? By mid-August, shippers, transporters, distributors and retailers were still struggling to get clear of the backlog at ports and the City Deep container yard. Incoming emails and various online reports stated that City Deep was clogged to a virtual standstill with some 8 000 containers struggling to get in or out of the terminal. What steps will be taken in the future to improve these ever-increasing and costly delays? From a DoT perspective, a decision needs to be taken sooner rather than later to resolve the now nefarious hi-cube container (HCC) debacle. The ISO 12,1 metres long (40 feet) HCC is 2,9 metres high (9,5 feet) and usually exceeds the maximum legal overall height of 4,3 metres when transported on a conventional six- or seven-axle flat deck vehicle. This is mainly due to the high fifth-wheel height of the widely used European built truck-tractors resulting in a deck height in excess of 1500 mm. 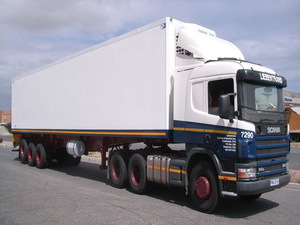 The DoT and the SABS (South African Bureau of Standards) are reluctant to yield to pressure from transporters and shippers to increase the present maximum overall height. This is an understandable attitude to avoid tinkering with regulations and opening the door to demands from the road transport industry to increase the allowable overall length and width. However, the matter cannot be left unresolved. The moratorium granted by the DoT pending a sensible solution cannot be indefinitely sustained. Preferred international container movements are now firmly entrenched in HCCs. In terms of payload, the economy of scale is obvious. As an example, when transporting deciduous fruit such as plums and peaches, the increased capacity is equal to almost three extra pallets or 140 to 150 trays. Marine shippers have a large investment in these boxes to meet international demand and are not going to depart from market demand. To make a sensible solution even more urgent, there is now evidence that international shippers are well on the way to introducing the hi-cube concept to the ubiquitous TEU (an ISO standard 20-ton capacity 6-metre container). Failure to resolve the problem will have a significant negative impact on South Africa’s ability to compete in global markets. What then should be done to resolve this long overdue challenge? Double Decker buses and car carriers regularly exceed 4,3 metres. There is no history of these having accidents, rolling over or damaging bridges. There is no history of accidents and roll overs of HCCs hauled by transporters on flat-deck 6-axle and sevenaxle vehicles. If there is a history why is not in the public domain? If KZN traffic law enforcement fines and impounds them, why now and not before? If the reasons are a question of accidents and instability, when will the statistics be published? Some suggestions favour applying for abnormal load permits every time a HCC must take to the roads. Clearly this is unsustainable and it is undesirable. Perhaps a better suggestion is to exempt the transport of HCCs and licence them accordingly to only transport an ISO HCC. This can be supported by attaching a plate or other signage to indicate what the vehicle may legally carry. In this way, as it is with BRT buses and refuse collectors, the transport of HCCs can be properly controlled. Finally what can be learned from markets such as the UK where the maximum overall height is said to be just 4.0 metres? Has the matter ever been put to vehicle importers to establish whether chassis with a lower fifth-wheel height are available for this work? Unquestionably, it is time for the Department of Agriculture, the PPECB, FPEF and the RFA to come on board and assist the DoT in resolving this issue once and for all. Back in 2008, transporters of perishables were severely stretched to survive the diesel spike. Only intense effort and focus kept the wheels of many turning. 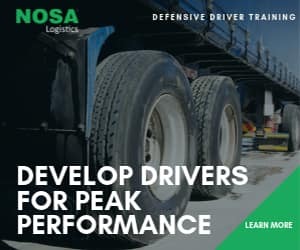 In 2009, the recession threatened to wipe out any number of fleet owners as the battle to find sufficient volumes and payable loads threatened the existence of even some of the most experienced transporters in the country. Now in 2010, there are reports of improved volumes – as much as 15% in some areas. Interestingly, if not amusing, are the many reports that transporters and producers could not report any notable upswing in volumes during the FIFA World Cup month. Regrettably, most of the transporter and fleet owners that contribute to this annual update expressed their disappointment with equipment suppliers in terms of less than acceptable parts availability, parts prices, poor quality, sloppy workmanship and indifferent technical support. Similar dissatisfaction emerged earlier this year when gathering feedback from transporters generally in FMCG distribution. The shortage of reliable drivers remains a universal challenge. Young men keen to become professional drivers continue to shoot themselves in the foot by being unreliable, careless and have poor attitudes. Employers continue to favour the older person and are now looking at drivers with at least three years experience who are not less than 30 years old. Other than the usual challenges arising out of back door blues, traffic and harbour congestion and poor roads in some areas that add cost to maintaining fridge units, vehicles and trailers, a major challenge facing the sector is going green. As highlighted in a separate article in this feature, this is especially so since the emergence of the ecoFridge, environmentally friendly packaging and lower emissions. Fleet managers say the major driving force to go green comes from within the company, mainly motivated by management. Body and trailer builders and suppliers of conventional fridge units are going through a quiet time. The current year has been more about dry volume vans mainly from the large inhouse fleets. Demand for insulated boxes is, according to the builders, likely to pick up from October. Demand for refrigerated load boxes and trailers have traditionally been somewhat cyclical. Transporters and fleet managers that bit the bullet and invested in Kingtec fridge units will be pleased to learn that Transfrig have taken up the reigns and will provide parts, service and technical backup. Peter Solomon says Transfrig has already taken the necessary steps to secure a team of experienced and technically competent personnel to support Kingtec users. As we know transporting perishables locally and for international markets is not for the faint hearted or the general transporter unwilling to make the investment in equipment, trained personnel and ongoing gathering of knowledge and experience of what drives this vital industry. Steps need to be taken to ensure the emerging national strategy for road transport does not add additional cost by way of disincentive charges while rail transport remains moribund. Rail is a vital aspect if South Africa’s national transportation mission is to be realised. However, with the best will in the world, it will take at least a decade before this becomes a reality. Tinkering with regulations to amend the present maximum axle loads will result in adding cost to road transport and consequently food prices and agricultural exports. It makes more sense to enforce road traffic regulations in respect of overloading in an efficient and consistent manner. The demand for HCC will continue to grow and be a requirement if South Africa is to retain its hard won market shares. A decision must be taken without delay as to how this can be legally accommodated in South Africa. The world is going green and so is South Africa. This will reach beyond fundamental issues such as the ecoFridge and cleaner diesel fuel. There are strong movements to upgrade packaging , in both format design and more eco-friendly materials. Recent studies are showing there is room for improvement in various legs of the cold supply chain, even in the most surprising aspects. With this in mind, it is pertinent to mention the excellent work being done by the “Post-Harvest Innovation Programme’, an initiative of the FPEF to develop an innovative and globally competitive fresh fruit industry. The vision for this is the opportunity to grow the economy, jobs, skills and support services. Dr Malcolm Dodd, programme manager, says export fruit moves through a long supply chain and its value increases from the time it is picked to the time it is sold. This increase in value is roughly tenfold from farm gate to marketplace. The amount received by the producer, who has the most risk, represents a relatively small return on investment. Any change in costs within the value chain can have enormous positive or negative impact on returns. It is highly recommended to make contact with the FPEF to obtain a copy of its elegant and innovative book that describes and illustrates the various initiatives currently in process that identifies the many links in the trade value chain that are being innovated. To name a few, these include integrated packaging , especially for citrus, carbon footprints, technology interchange and a host of other cold supplychain elements. The book has a most innovative format to illustrate the various legs of the value chain that need to be managed. My sincere thanks to the many transporters, fleet managers, suppliers and related roleplayers that contributed to this update and my sincere wishes we will soon see some real progress in the resolution of the challenges the industry continues to face.